New? Well some options are not that new really. Others are however! The below is from a Windows 7 SP1 machine, which shows the options that are familiar to many. Though there are a couple of options in there that may have squeeked by…. For reference purposes, the options present in newer versions of Windows are covered at the bottom of this post. There are some nice new additions, so read all the way to the end to review. Typically I will be using netstat -anob when reviewing what services are currently listening. For example on an Exchange 2010 CAS server to ensure that the static port assignment for RPC Client Access and the Address Book is as expected. The below is an example of old way of getting process information. If we run netstat –ano we will get the PID, but then have to do additional steps to obtain the process information. In task manager, we can sort the PID column to then identify the process. If the PID column is not present, you will have to add it. Note that in current versions of Windows this is done by right clicking the column header along the top. This is the yellow highlighted area below. The big red arrow indicates the PID. Unsurprisingly since we were looking at what was listening on TCP 25, it is Front End Transport (FET). tasklist /FI "PID eq 13804"
This is a brief recap of what’s new and improved with the recent builds of Windows. What’s new in Windows 7 that I might not have used? -b Displays the executable involved in creating each connection or listening port. This was not present back with Windows XP RTM, it was added later in the build cycle. Thanks to Dima for noting that! What’s new in Windows 2012 builds? NetworkDirect NetworkDirect is widely used for high-performance computing (HPC) applications in which computational workloads are distributed to large numbers of servers for parallel processing. In addition, various financial markets trading workloads also require extremely low latency and extremely high message rates, which RDMA can provide. What’s new in the Window 10/ 2012 R2 builds? -q Displays all connections, listening ports, and bound nonlistening TCP ports. Bound nonlistening ports may or may not be associated with an active connection. This command is very useful as it allows you to see if you are out of dynamic ports (ephemeral ports) and running into port exhaustion issues. * – Yes, the Sir needs to be included! 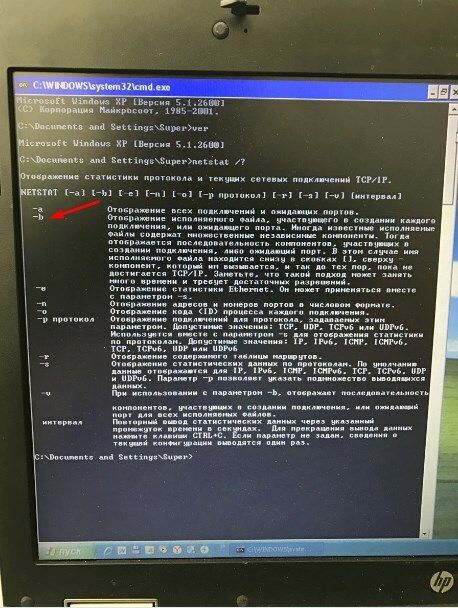 Sorry about Cyrillic text, cause I can’t find English XP anywhere, and a friend of mine help me with it taken picture from an old HP notebook. Yes – that is correct, it does! Though it was not present at RTM — was added at a later point in the build cycle. I dusted off at 15 year old ISO to have a play with this. Oh the memories…… I’m going to play the Windows XP setup music all night in honour of this! Yes, the memories… Thank you for your post, it’s cool as always. I bet this changes happened at SP2, when we get firewall enabled by default and many more juicy network changes. Anyway, without this page I would not touch those memories!